The author avatar. We see this creature all the time in fiction: a protagonist who is, more or less, a stand-in for the author. To a degree, this is inevitable and not completely avoidable. After all, we are told again and again to “write what you know”. This is why so many main characters in novels are writers or journalists themselves, or if not, then they at least hold common characteristics of writers (thoughtfulness, independence, etc.). The character in real life into which I have the deepest insight is myself. So why not model my main character on myself? The problem is when the main character is based on a skewed, idealized version of ourselves– one which inflates our positive qualities and ignores the negatives. The protagonist, after all, is usually the hero of the story. His motivations are correct (even if he may be misguided in one way or another), and he just needs to overcome the obstacles in his way in order to achieve his goals. Sound familiar? That’s because this is also how people generally see themselves. Behold the human ego, which makes it very difficult to admit when we’re wrong. More and more people today answer the question, “would the world be better if you were in charge?” with an emphatic “Yes!” Such a response betrays a certain narcissism and, when you stop to think about it, a quite unreasonably secure faith in one’s own abilities. The danger, then, lies in creating a protagonist who really can overcome his adversaries, woo the romantic interest, and save the world all while embodying the characteristics and abilities of the author (based on the author’s vision of himself, that is). Not only does this create a flat, boring character, but it has the embarrassing effect of betraying the high self-image the author. What can you do, as a writer, to fix the author avatar? There are a couple things you can do: Make your author avatar more real (while confronting your own true self), or make your avatar less of an avatar and more of a unique character. I have tried both of these methods with my character of Zinke in “Map of Daggers”, and I’ll give examples below. First, make your avatar more real by embracing your imperfections. This means realizing that you, like every person who has ever lived, are composed of positive and negative qualities. Your success depends in part on the balance between these qualities. Therefore, any realistic author avatar should hold some of these negative qualities as well. The character cannot just sail to victory on his own abilities, but should have to contend with his own limitations and the possibility of being wrong sometimes. I guess people could disagree on this, but I think any interesting character needs serious flaws. Zinke, the brave, gifted cartographer, is my own author avatar, based partly on an idealized version of myself, if I lived in a pre-industrial fantasy world. But I have tried to give him some negatives, too. He is sometimes cranky and does not work well with others. And at times he has to admit he is completely wrong and it is time to change course. Second, make your avatar more of a unique character by not using your own characteristics and finding others to give him. For example, if you are the bookish type, you may make your hero an athlete. Or you could write as a different gender, or a very different age group, or someone from a very far-off part of the world. But the simplest, really, is a change in personality. In my own case, I made Zinke much more of a leader type than me, and he takes a very active role as Chief Cartographer of the Kingdom. The benefit to making your protagonist less of an avatar is that you can approach your story more objectively, because it is more difficult to feel that you are living vicariously through your protagonist’s actions when he does not resemble you so closely. Thus, we can focus on what makes sense in the story and the larger theme, rather than what we want to do as avatars in our own story. Do not be surprised next time when the subconscious urge to avatar-ize your protagonist emerges. It’s natural! And a little bit of an avatar is okay. But an avatar feeding on author ego can grow into a monster that threatens to devour an otherwise compelling story. Consider the above to eradicate such a beast from your work. Arctic Land Grab Map. Just when you thought that there was no new land to be discovered and claimed, suddenly we’re seeing a growth in unclaimed land in the Arctic Circle due to the melting of the polar ice caps. World powers, predictably, are disputing who has a claim to this land. The major players up here are the US, Canada, Russia, Denmark, and Norway. The appeal in this icy, barren land is the possibility for oil and new trade routes through the ocean. (via The Economist). These are just a few of the 40 maps featured in the WaPo post. 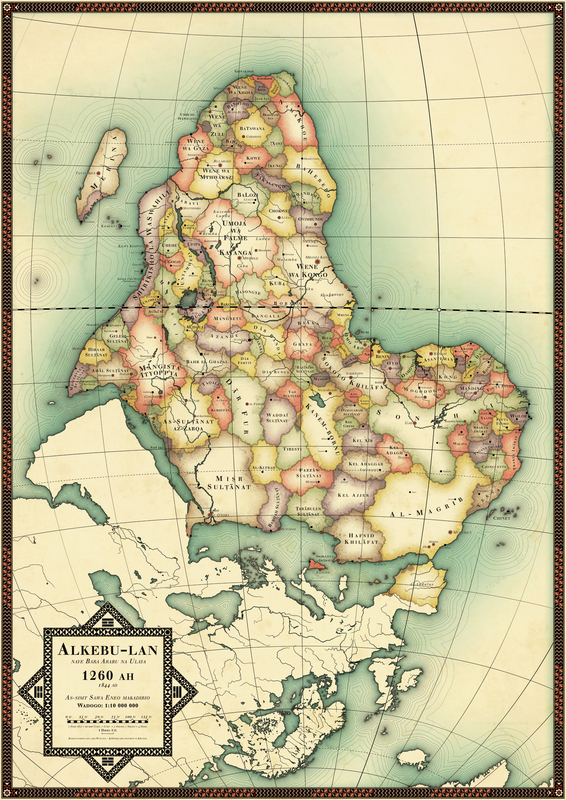 What other maps from the post did you find especially interesting? Why Do So Many Fantasy Maps Share This Feature? Look at enough fantasy maps, and you’ll start to see a familiar pattern: ocean to the west, land to the east, stretching beyond the borders of the map. The so-called “Left-Justified Fantasy Map” is so prevalent that it even has a trope named after it on tvtropes.org, an extensive catalog of recurring themes within movies, tv shows, and books. 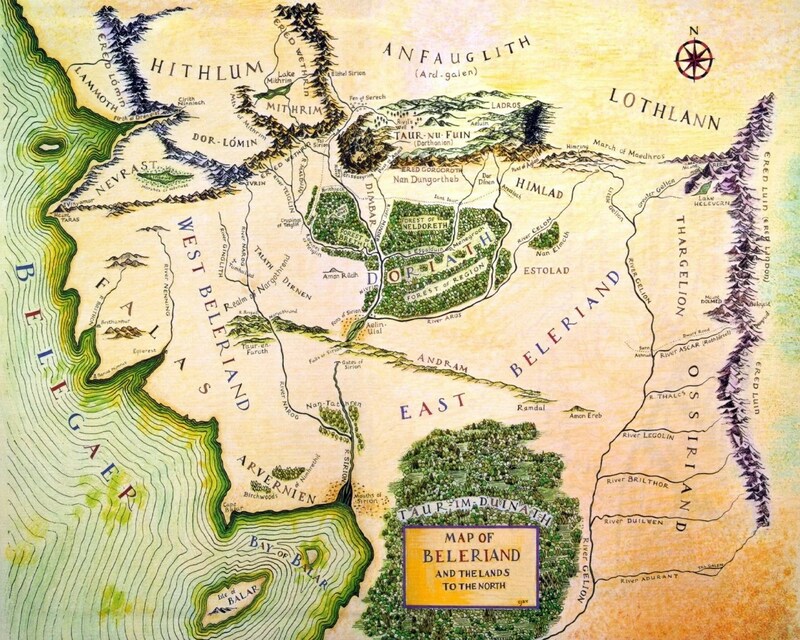 The first prominent example of the Left-Justified Fantasy Map is in the works of Tolkien. He based Middle Earth from the “Lord of the Rings” novels on medieval Europe, so the ocean to the West reflected the position of the Atlantic Ocean relative to Europe. The same basic structure is replicated in the map of Beleriand for the book “The Silmarillion”, which also takes place in Middle Earth, but in a different area. Fantasy writers since Tolkien have taken a similar approach to their maps. Below are just a few examples, from Eragon, The Wheel of Time Series, and Redwall. All have ocean in the West and land in the East, although there is considerable variation in the shape of the coastline. 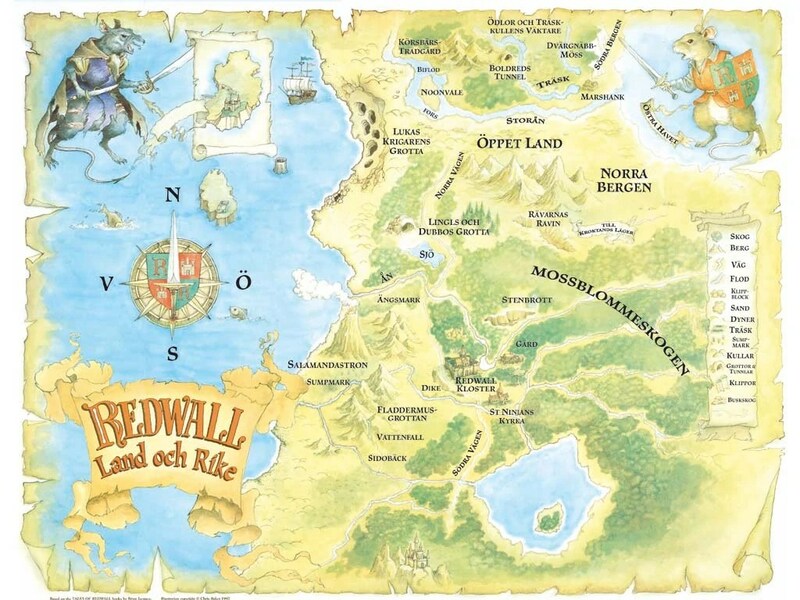 Map from “Redwall”, by Brian Jacques (via http://redwall.wikia.com/wiki/Redwall_Map). Note that one of the most famous fantasy worlds, Narnia, actually has the ocean in the East and the land in the West, as you may recall from an earlier post. C.S. Lewis, who was a friend and contemporary of Tolkien, may have created his world this way to give it more hopeful mood. The sun rising in the East over the ocean gives the impression that the world is getting brighter and better, whereas the world of Middle Earth, with the ocean in the West, is fading like the setting sun. At least, that’s one theory on tvtropes.